There are 23 others, but these games all have one big thing in common: two years ago, they wouldn't have been conference games. Half of these teams were part of the first wave of the NCAA's unprecedented conference realignment, which began in 2011 and will continue until 2015. When all is said and done, 18 schools will either switch between BCS conferences or join BCS conferences as new members. The backlash against this realignment falls into two camps. The first is that the conferences are losing their regional identity, i.e. "I remember when the ACC was actually on the Atlantic Coast." The second is that the conferences are spreading too thin, making problems for athletes and fans alike. Are these valid complaints? The map above shows the geographic distribution of the conferences in 2010, before realignment. The red dot is the geographic midpoint of the conference's programs, an indicator of where the conference is centered, and the radius of the circle is the AVERAGE DISTANCE of each program from this midpoint (not all programs fall within the circle), a good representation of "compactness." This map shows the new geographic distribution of five of the conferences (we'll get to the Big East in a moment), once the planned realignment is complete in 2015. Taking a look at these five conferences, it seems like the death of regional identities may have been exaggerated. The Pac-10/12 did move east from the Pacific, but only by about 90 miles, as Arizona and Arizona State were already further east than people realize. The ACC barely budged from the Atlantic (11 miles west) because the East Coast doesn't run as straight north/south as people think it does. 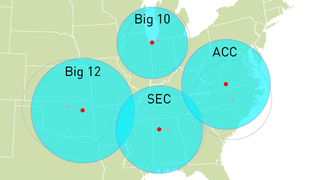 The Big 12 and the SEC moved towards each other by 165 miles, and will likely collide someday in a sweet slo-mo explosion. The Big Ten barely twitched. Every conference became a little less compact, but only by 12 percent on average. Now let's look at the Big East. When a star dies, it expands outwards and outwards until it furthermost layer sheds off into space and its core collapses. This is basically what the Big East is up to right about now. The Big East was once a Northeastern conference, in this realignment it will add schools in the Northwest (Boise St.) the Southwest (SDSU), and the Southeast (UCF). This will send the conference's midpoint a remarkable 465 miles west and 140 miles south, while the average distance from this midpoint will spike 120 percent to 713 miles. So congratulations to Benton, Ky., the new center of the Big East. Enjoy it while it lasts. Since 2004 the conference has moved more than 600 miles west; by 2049—like Northeastern settlers of old—it should find its way to the sweet waters of the Pacific.